Aging has always been considered an inevitable process. But the discovery that the aging process itself could be ‘hacked’ has led to the concept of ‘health span’ as opposed to merely ‘lifespan’. A long life is not necessarily marred by disability and death and specific dietary interventions in particular may promote healthy long life. However, much of this data results from animal data as it is difficult to experiment on live humans. 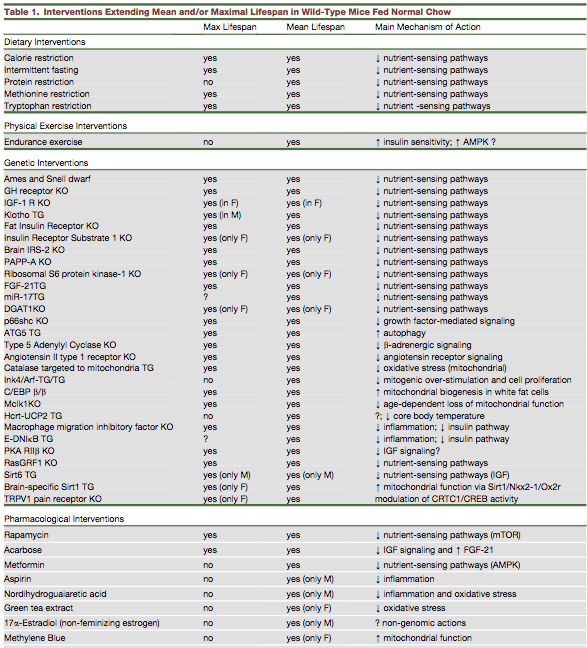 The table below illustrates the results from dietary, exercise, genetic and drug interventions and their main mechanism of action. Pay particular attention to the column ‘Main Mechanism of Action’. 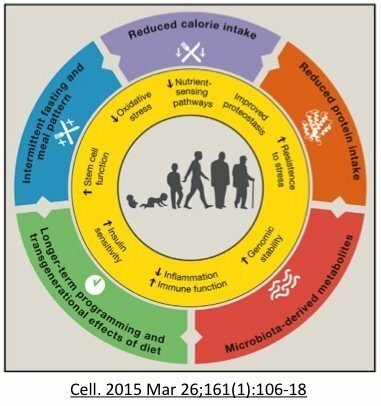 This is the best guess as to how all these different interventions may increase lifespan. In addition, there is a clear correlation between better mitochondrion functioning and decreased nutrient sensors. Mitochondrion are the powerplants of the cells, and it is obvious that cells need to have power to work properly. Activation of SIRT1 and AMPK activates PGC-1a, a key regulator of mitochondrial function, antioxidant defenses, and fatty acid oxidation. AMPK is a highly conserved regulator of energy homeostasis and links energetics to aging. AMPK is a sort of reverse fuel gauge of the cell. ATP is the molecule that carries energy in a cell. When this level gets low, AMPK goes up. AMPK induces mitochondrial biogenesis (creation of new mitochondrion) as well as regulates mitochondrial metabolism and dynamics. In the 2017 study, Weir et al show that AMPK can maintain youthful mitochondrial network morphology even with aging. When they exposed animals to Intermittent Fasting, there was a striking change in mitochondrial networks. Both fission and fusion are required to maintain health and lifespan. Recent (2017 Weir et al) work highlights the key role that dietary restriction may increase lifespan by affecting mitochondrial networks. Mitochondrion are part of networks that can fuse together (fusion) or break apart (fission) in constant remodeling. A dysregulation of these mitochondrial dynamics and abnormal morphology (shape) of these mitochondrion are hallmarks of aging and thought to contribute to many degenerative diseases such as Alzheimers and Parkinsons. With age, many studies report increased swollem fragmented mitochondria. Mitophagy, a process of degrading damaged mitochondrion and recycling, plays an important role in keeping the dynamics normal. If this holds true for humans, then dietary interventions are the key to longevity. This has refocused attention to meal frequency, timing and intermittent fasting. During our evolutionary history, most large animals and humans ate only intermittently. Long periods of starvation were normal, whether due to seasonal changes or due to episodic weather events. Many animals developed forms of quiescence in response to the onset of food shortages. If food was not available, then most of the cells in our body stop growing. Importantly, the same genes that control quiescence also control lifespan. In rodents, fasting for 24 hours every other day or twice weekly extends lifespan up to 30%. Chronic caloric restriction may also have similar benefits. 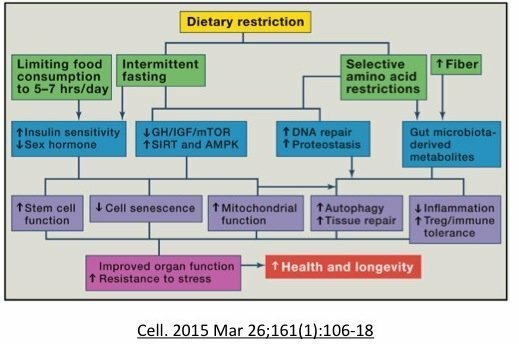 Fasting may promote mitochondrial function, trigger autophagy and DNA repair pathways. But what is more controversial is whether the benefits relate to caloric restriction in general, or whether it relates to specific nutrients. Original studies from 1985 suggested that it was calories, rather than protein. However, a point overlooked originally was that these animals were not food restricted. Subsequent studies, (eg. 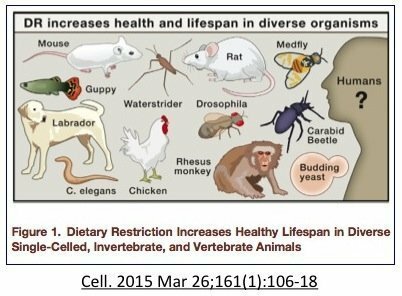 Grandison et al, 2009,) Solon-Biet 2014, Nakagawa 2012 and others pointed specifically to protein restriction as the key to longevity in these animal studies. Most believe this is due to dietary protein’s key regulatory effect on mTOR and IGF1. In humans, unlike rodents, severe calorie restriction does not reduce serum iGF-1 concentration unless protein intake is also reduced. Is it all protein or certain amino acids? The answer is not known. In animal studies the specific amino acid that is critical differs between species. In humans, branched chain amino acids seem to be a particularly strong activatory of mTOR. Compared to other dietary interventions, intermittent fasting appears to be far more powerful because alone has the ability to affect all 3 nutrient sensors simultaneously, as well as stimulate autophagy and mitophagy. mTOR is sensitive to dietary protein. Insulin is sensitive to proteins and carbohydrates. So eating a pure fat diet (not realistic) may lower mTOR and insulin, but will not be able to raise AMPK, since that senses the energy status of the cells. If you are eat a very high fat diet (ketogenic) your body will still be able to metabolize this to energy – generating ATP and lowering AMPK. 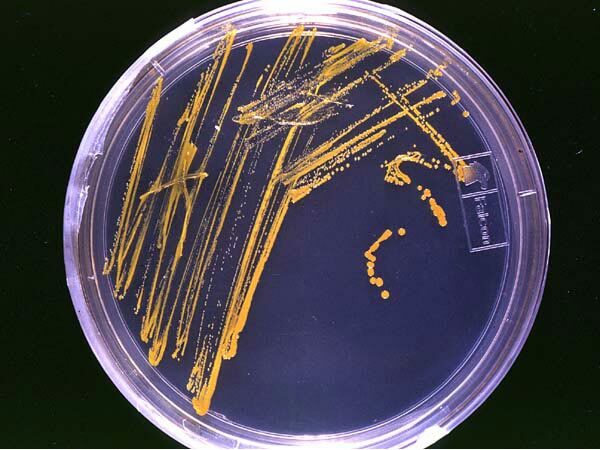 Only 2 of the 3 nutrient sensing pathways have been alerted. Only complete restriction of nutrients will have this effect (ie. fasting). Theoretically, eating less frequently may significantly improve health. Most omnivorous mammals eat only intermittently, since we tend not to live on a Petri dish where nutrients are constantly available. Carnivores like lions and tigers often eat once a week or less. Ancestral humans tend to eat intermittently depending on food availability. Being able to function at a high level, both physically and intellectually, for extended fasting periods was fundamentally important to survival. This explains our well developed systems for food storage (glycogen in the liver, and body fat), and also our highly conserved nutrient sensors to slow cellular growth during a period of low nutrient availability. Things changed somewhat with the agricultural revolution approximately 10,000 years ago. From a hunter-gatherer society, agriculture allowed populations of humans to stay in one area and resulted in more stable food availability. However, there would still be seasonal variation and possibly long weeks or months where food is less available. There would also be shorter periods of time, days – weeks, where food was restricted. Most humans ate between 2-3 times per day. Without light, it would be difficult to eat a ‘midnight’ snack in the pitch blackness. 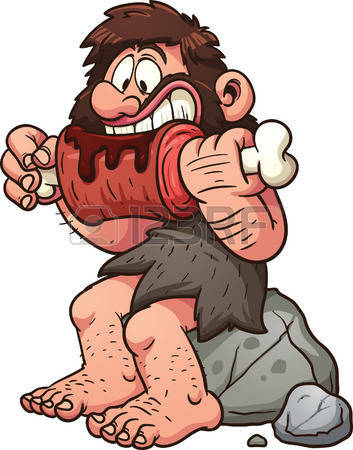 So early humans still followed a tradition of a long overnight fasting period – hence the term ‘break-fast’. Different nutrient sensors are sensitive to different time durations. That is, it would be useful for our body to know whether nutrients were restricted in the short term (overnight) in the medium durations (days) or long durations (weeks – months, seasons). You can see that our human body has evolved exactly those same capabilities in our nutrient sensors. Insulin spikes quickly after a meal, but falls just as quickly during an overnight fast. It responds primarily to carbohydrates and proteins. While protein does not raise blood glucose, it raises insulin quite a bit. It also raises glucagon, so that blood glucose stays stable. mTOR is mostly sensitive to protein and particularly branched chain amino acids. It does not fall as quickly and takes somewhere from 18-30 hours to activate. AMPK is the reverse fuel gauge of the cell (AMPK goes up as cellular energy stores of ATP deplete) and only increases with prolonged energy deprivation. All macronutrients can contribute to ATP production, so AMPK is sensitive to all macronutrients. These nutrient sensors overlap somewhat in their sensitivities and functions but each is also unique. In this manner, our cells are able to gain exquisite information about the particular macronutrient availability of the outside world. Crafted by millions of years of evolution, the biochemical wizardry of our nutrient sensors makes a mockery of our comparatively dull brain that can only say ‘Look like food to Grok. Grok eat.’ But we don’t need to understand all the complicated biology to gain the benefits. We can begin to regain some of our lost ancient wisdom by following the ancient food tradition of taking a break from eating once in a while. Give yourself a chance to digest the food you’ve eaten. Intermittent fasting. Boom. The question is how long does it really take to activate AMPK. Do i really need to fast two weeks? to answer my own question: it does appear that a two days fast can not change AMPK appreciably. But the next question is, if I do a long fast, will the benefit extend over a long time? I think I can do one long fast a year. In a discussion of high intensity interval training (HIIT) vs endurance training, authors below note that HIIT signals activation of PGC 1 alpha through the AMPK pathway. It might be fair to take that to mean that no, you don’t have to wait a long time, but rather start doing HIIT. Many thanks. But 1) that is a model 2) I am past 60. As a former elite runner I used to do interval training, but now the whole notion of of forced indoors training is unappealing. I do play soccer, where 10-15 second bouts of effort happen many times over an hour. I wonder if that is enough. I always felt that soccer was necessary, given that my other activities are low effort (walking, biking, swimming). I’m not recommending, just reporting. On the other hand, I accept that HIIT is unappealing by definition. Soccer might do it, just from observation, but I don’t have a handy way of knowing. If impact is an issue, 20-30 sec, all out intervals on an elliptical does the job the quickest that I know about, you only need 2 or 3. But here’s the best part: If I’m reading Fung correctly, it’s all irrelevant; it’s the fasting that does it. Been doing it a couple of years now. I believe you are right and I should have been a lot more precise. I implied that fasting in the absence of HIIT and strength training is sufficient. That is not what I think, not how I live, and not what I wanted to say, especially to a readership of many different needs. I meant only to address the signaling mechanisms. We are in the deep weeds now and should probably stop thrashing. You need to fast one day every week and one month every year. The fast must be in such away that you stop eating and drinking from dawn to sunset. You fast Only when you are not sick . Thanks Dr Fung for the informative article as well as an answer to the rough time needed to get autophagy going. Is there any research on whether autophagy has positive effects for those with auto immune diseases? I cured serious Lyme with extended periods of dry fasting. Seems to me then that if the above is true, the way body builders eat will most certainly decrease longevity and health markers. If we decrease protein too much, we will lose lean mass if we are more muscular than average via resistance training and higher protein intakes to achieve greater lean tissue. I’d rather die 5 years younger and powerful than live to be 110 and decrepit. The body builders you know seem to eat a lot differently than the ones I know. They swear by ketogenic diet and intermittent fasting. Carbs only come into play if they are trying to bulk up short term for a competition. The post you replied to didn’t say anything about carbs. It did mention. I believe ketogenic diet bobybuilders do still eat a lot of protein, and while that is helpful for muscle growth it seems contraindicated for lifespan and overall health. Great point. Maybe someday we will have better studies to know that. Then again we really would need a way for each individual to determine how much their own body need based on their own genetics and lifestyle. And that’s hard to imagine anytime soon. Excellent…..you are on the right track. No mention of cold conditioning, aka cold shocking, contrast showers. Thanks for the science in layman’s terms and outlining the (literally) long term benefits of fasting. I’m interested not so much in longevity, but in the effects of fasting on progressive diseases, like muscular disease or ms. If the body stays ‘younger’, would the progression of the disease slow down? I believe there are many posts by Dr. Fung on this site that address that kind of issue and concern. The point is that reducing insulin on a regular basis slows some of that, and that IF, to the extent that it encourages or increases autophagy and related processes at even the intra-cellular level, and thereby results in reducing the issues you describe. Our well developed systems slow cellular growth during a period of low nutrient availability but how can we explain that Human Growth Hormone rise during fasting state ? because HGH is related to cell growth. So maybe HGH is here just to tell the body to start neoglucogenesis during fasting ? Can one take Vitamins while doing IF or LF? Will Vitamins negate autophagy? https://www.ncbi.nlm.nih.gov/pmc/articles/PMC1664837/. Layman here, have been fasting and looking for information on creatine monohydrate while fasted. Would the study here indicate that it could upregulate AMPK, thus potentially having longevity benefits?